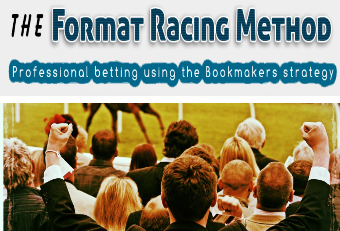 On my last post, 11th July ‘The Inform Racing Race Cards’, I discussed three methods that had recently provided good winning bets using the ratings and one of these was following top distance winners. 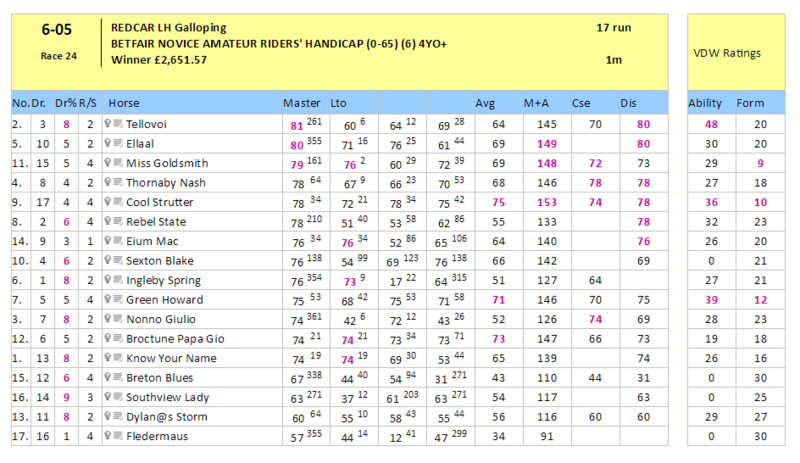 On the Inform Racing race cards, there is a Distance column (Dis) and this gives the best speed rating for each horse at today’s distance, over the past twelve months. A short while after I wrote that post, I started to look a little deeper into these results and decided upon a new idea that would incorporate these top distance winners along with other form criteria, to see if I could bag more selective winners, rather than just backing these horses blindly. 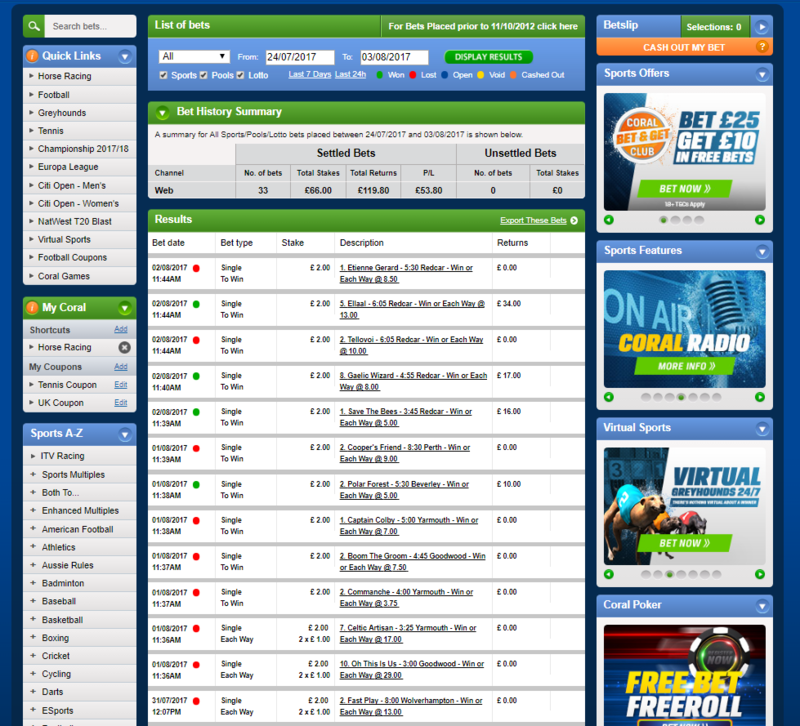 Since starting this idea on July 24th, there have been 33 bets, with 7 winners, giving a 21% strike rate and a profit to SP of 29 pts, all in just 9 days. The horse must be top or joint top rated in the Distance column and its Master rating must be equal to or better than that Distance rating. 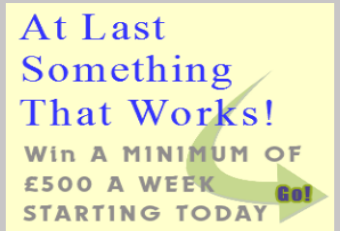 The horse must be running in an all age handicap, so only races for 3YO+, 4YO+ etc. and no Novice Handicaps over the jumps. The horse must now have a handicap mark of equal to or lower than its last handicap win. The horse must have won within the last year, or 365 days. I think you will agree that all of these points combine to give a solid and sensible reason as to why a horse that qualifies may have a good chance of winning. The horse has the best speed rating at today’s distance and has won within the past twelve months, now racing equal to or lower than its last handicap win and the trainer is not out of form. All of this is very easy to do when using the Inform Racing race cards, as shown with 16/1 winner Ellal yesterday at Redcar. In this race there were two qualifiers in the one race, so both were backed. The other horse Tellovoi, actually refused to race but luckily ther other selection Ellal won. 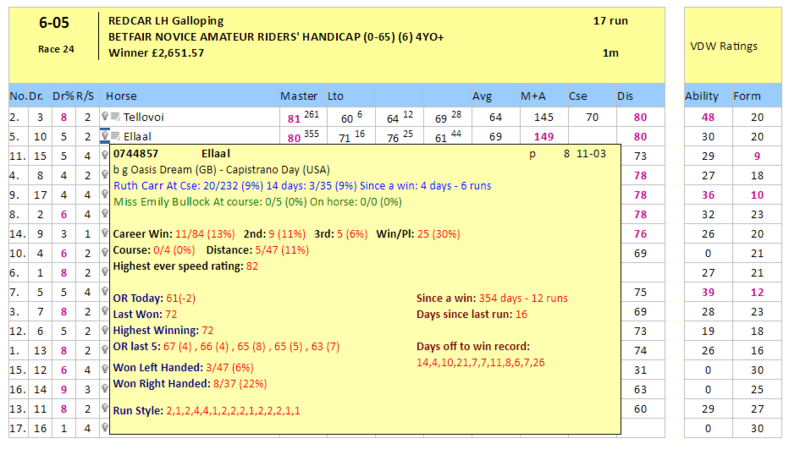 Here is the race card, an all age handicap (4YO+), sorted by the Distance column where you can see Ellal and Tellovoi both have the top rating of 80. When you then hover your mouse over the first pop up box for the horse, you get all the other information required to decide whether this is a selection or not. As you can where it says OR Today, the horses Official Rating, or handicap mark today is 61 and its last winning mark (Last Won) was 72. As long as the mark today for Ellal was 72 or less we are okay. The (-2) after the 61 just means it has been dropped 2 lbs since its last run which you can see was 63 at the end of OR last 5 where it finished 7th (7). Note: If it is blank or it shows a 0 after Last Won, then this cannot be a selection. Next you can see that the horse last won, Since a win, was 354 days ago, so under the twelve months stipulation and at the top in blue you can see it is only 4 days since trainer Ruth Carr had a winner, so the yard is comfortably in form. 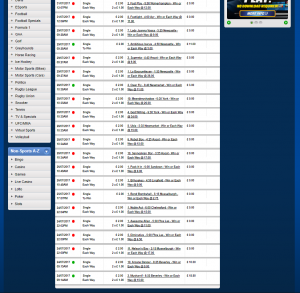 Open the race cards by race time order, scroll down to the all age handicaps for the day, check the top distance figures and hover over the pop up box. All in all it should take no more than ten minutes to go through a busy day of racing. It should be mentioned that this is only a very small test over just 9 days, but as said earlier you have the basis for a sensible selection method and as its been proven you will come up with some nice priced winners. There has also only been one horse from over the jumps at Perth and this lost but more recording is required here to see what happens when there are other jumps results in the bag. 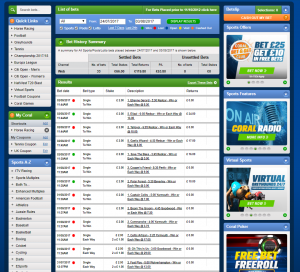 Below are two images of the 33 bets I have placed from my Coral account which I am using exclusively for this test. As you will see I started betting £1 each way, or £2 win if the early price was shortish, however I decided to ignore the each way bet as of yesterday and started betting the full £2 on the win. Good timing as there were three winners yesterday! There have only been two placed horses, including Etienne Gerad yesterday, 2nd at 12/1, along with Ower Fly at Newmarket, so it seems the horses either win or lose and it is better to go full on for the win, but that is up to you. You will also see that the bet on Fast Play shows on both images, just to prove all bets are shown and no losers between Fast Play and Footlight were cut out by me. Click the images to enlarge and open in a new window. You can of course add your own filters to the criteria I am using but I like the simplicity of the selection method and the chance of getting one or two big wins now and then. 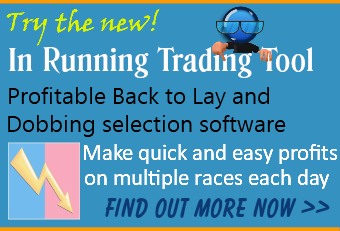 I have found three selections today and have taken early prices of 6/1, 9/1 and 10/1. Good luck if you are going to give this a go!